Ultraviolet (UV) Sterilizers/Sanitizers for For All Types of Residential Pools. Eliminates Microorganisms That Typical Chlorine Levels May Not Kill. If you use a salt chlorine generator or standard chlorine sanitizers to maintain your pool water quality, there are microorganisms that may be resistant to regular chlorine disinfection levels. However, when pool water passes through a NUVO UV Sterilization Cell, these pathogenic microorganisms are eliminated, to the extent of 99.9%. This is the same process used to sterilize surgical instruments and to assure water quality in many industrial applications. While a NUVO UV Sterilizer may nearly totally destroy the microbial content of the water, as it passes through the cell, it has no effect on algae and other microorganisms, that might be in the pool or spa. It will not oxidize or destroy wastes and byproducts, that can accumulate, in pool or spa water. For these reasons, Ultraviolet sanitizers must be used with an oxidizer and persistent sanitizer, such as chlorine or bromine. There are many advantages for using this combination. The UV will eliminate the most serious pathogens, lower the overall microbial populations and allow the chlorine or bromine to better performance the necessary oxidation function, while maintaining proper pool sanitation. The net effect is that you'll use fewer chemicals, reduce chemical byproduct buildups, have less odor and increase the effectiveness of chlorine or bromine sanitizers. When the NUVO Ultraviolet Sterilizer is employed, in addition to chlorine or bromine, and will instantly destroy pathogens such as E. Coli, salmonella, staph and streptococcus, giardia, cryptosporidium and many other chlorine and bromine resistant microorganisms. Water passing through the NUVO Ultraviolet cell results in the safest, cleanest pool water. For only pennies a month, you can help protect against pathogenic microorganisms, use fewer chemicals, create better water quality and actually reduce the amount of time required, for proper water sanitizing. NUVO Ultraviolet Sterilizers are designed for residential pool environments and will provide many years of reliable and problem-free service. The NUVO Ultraviolet system costs pennies a day, to operate and has no moving parts to break down. NUVO UV Sterilizers use high quality quartz UV irradiators, for quick action and extended life. The NUVO Sterilizer includes the necessary plumbing connectors and is designed and intended for residential pools only. 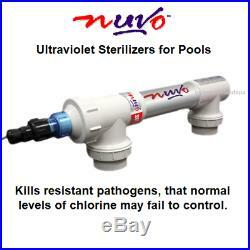 Safe water and more peace of mind, are a close as adding the NUVO Ultraviolet Sterilizer to your pool. Available in 2 (two) versions. Model 1500A is intended for above ground pool use and is designed to be hooked into the 110 volt power supply. Model 3000A is designed for use in all types of inground pools and is intended to be hooked into a 220 volt power. Model 1500A is 25 Watts. Model 3000A is 57 Watts. Bulb life is 14,000 hours. Can be used with 1-1/2" or 2" pipes: includes the necessary 1-1/2 reducers. 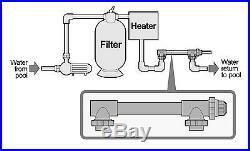 All units are required to be operated, only when the pump is in operation. The item "NUVO Model 1500A For Above Ground Pools Ultraviolet UV Pool Sterilizer" is in sale since Sunday, September 7, 2014. This item is in the category "Home & Garden\Yard, Garden & Outdoor Living\Pools & Spas\Pool Chemicals & Testing\Other Pool Chemicals & Testing". The seller is "todayspoolandspa" and is located in Apex, North Carolina. This item can be shipped worldwide.